Here's a pic just shot of Corals in Maritza The Vase Reef. The Psammocora is 4" x 3" x 4.5 tall. She's stuck onto the lower part of the glass. Any questions and or comments, please post. I love the purple digi, I bought what seems to be a blue digi but depending on light areas of less and more intense very from blue to some what purpleand it grows decently fast for me. Thanks so much for having a look and comments. 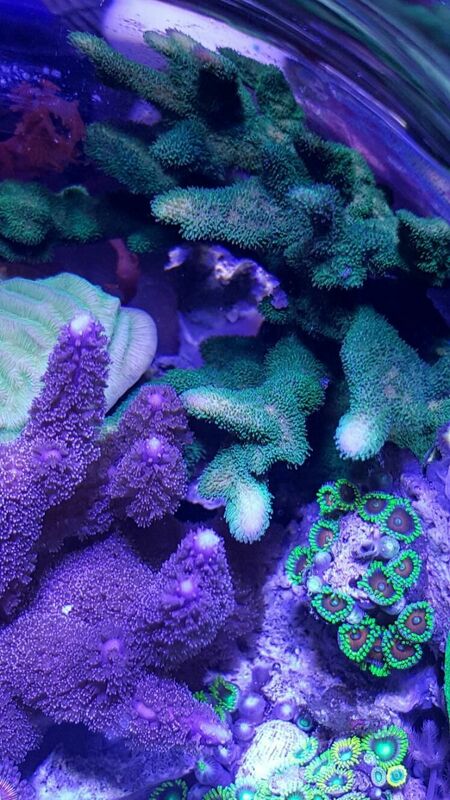 They're side by side but the Montipora Digitata Purple will destroy the Psamoocora. She can get aggressive at times. so far, everything is fine. Have my eye on both daily.